R.L. Stine is best known for his Goosebumps series of novels, but he's been scaring kids of all ages in a variety of books. Stine's Fear Street books were geared more towards teenagers, and nowadays that means the Stranger Things crowd, which may explain the latest addition to the film adaptation. 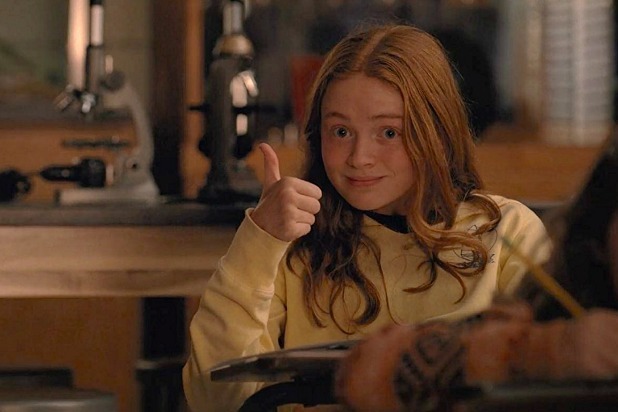 Stranger Things star Sadie Sink has joined Fear Street, designed as a trilogy of movies all directed by Liegh Janiak. Alex Ross Perry (Queen of Earth) was going to helm the middle chapter but dropped out with Janiak taking over all three parts. Sink immediately becomes the biggest name in a cast that includes Kiana Madeira, Olivia Welch, Benjamin Flores Jr., Ashley Zukerman, Fred Hechinger, Julia Rehwald, and Jeremy Ford. Details on her role are unclear but she's expected to appear in the second installment. Fear Street takes place in the fictional city of Shadyside, where teenagers face paranormal events and solve murder mysteries. Stine published the first book in 1989 and it led to multiple spinoffs, each much darker and bloodier than you would get out of a Goosebumps story.